As lawmakers consider disaster relief in the wake of Hurricane Florence, projects to rebuild North Carolina’s shrunken shorelines are likely to get a healthy chunk of government money. To their advocates, these so-called beach nourishment initiatives are crucial steps in buffering valuable oceanfront properties from storm damage and boosting local economies that rely on tourism. But such projects replenish the same vulnerable areas again and again, and disproportionately benefit wealthy owners of seaside lots. 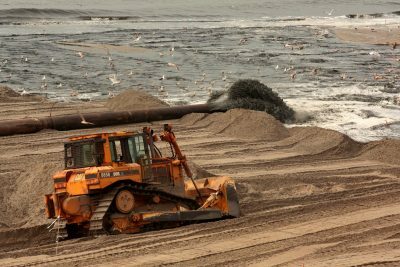 Moreover, pumping millions of cubic yards of sand onto beaches can cause environmental damage, according to decades of studies. It kills wildlife scooped up from the ocean floor and smothers mole crabs and other creatures where sand is dumped, said Robert Young, a geology professor at Western Carolina University. In the Rockaways in New York, where beaches have been rebuilt repeatedly, “the only foraging shorebird you typically see is a seagull with a french fry in its mouth,” he said. The U.S. has spent some $9 billion to rebuild beaches since 1923, a Western Carolina University database shows. Federal, state and local governments have spent more than $828 million to restock beaches in North Carolina alone since 1939, with much of that money coming from the Army Corps of Engineers and the Federal Emergency Management Agency. In some cases, the Corps’ support consists of in-kind donations of sand dredged from other construction projects. Newly nourished beaches suffer less erosion after storms than nonreplenished beaches. But the protection doesn’t last, as wind and wave damage chip away at the shore. 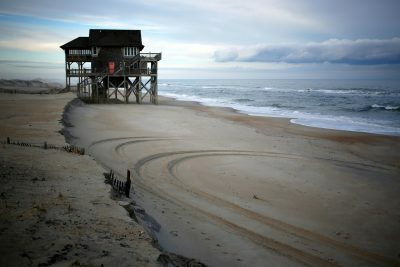 The same North Carolina beaches have been renourished over and over. Carolina Beach has been replenished 31 times since 1955. North Topsail Beach, part of a barrier island northeast of Wilmington, has gotten fresh sand just about every year since 1997. The Corps’ initial assessment of North Carolina beaches after Hurricane Florence found some damage, but it wasn’t major. In Carteret County, which receives sand but no money from the Corps, shore protection director Gregory “Rudi” Rudolph estimated they’ll need new sand on 70 percent of their 25-mile long beach. In recent years, FEMA has supplied most of the county’s beach nourishment funds through post-disaster grants. Though the projects help beach economies overall, experts say federal funds favor predominantly white, high-income towns, and even more so the properties right along the beach. The value of erosion protection “decreases rapidly as you move in from the beachfront,” said Mark Mauriello, a former commissioner of New Jersey’s environmental agency. A ProPublica analysis of 16 North Carolina communities directly behind beaches that have received federal funds shows they’re 94 percent white on average; a quarter of owner-occupied housing in these areas is worth more than $500,000 (compared with 7 percent in North Carolina as a whole). One of the beneficiaries in North Carolina is Wrightsville Beach, a town of 2,500 that has had $51 million worth of beach projects since 1990. An analysis of county assessment data shows that residential properties in Wrightsville within approximately 250 feet of the beach are worth $500,000 more on average than homes in the city overall. The Corps, tasked with managing flood risk across America, takes on engineering projects like building levees and renourishing beaches ostensibly because they prevent property damage from future disasters and lock valuable beaches in place. The Corps prioritizes projects that would prevent the most amount of damage per dollar spent. This tends to favor beach building in high-income communities full of pricey properties. The Corps generally funds projects only when the expected benefit is 2.5 times as high as the project’s cost. Poor communities can’t meet that criteria, said Derek Brockbank, executive director of the American Shore & Beach Preservation Association. Brockbank’s group advocates for federal funding of beach nourishment and lobbied on Hurricane Sandy recovery legislation. 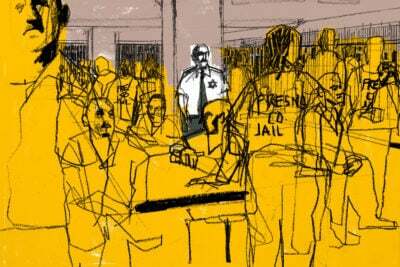 Andrew Kahrl, a history professor at the University of Virginia, said he couldn’t think of a single project that primarily benefited people of color. His research shows how the historically black communities that lived along the Carolinas’ coast were forced out by developers and federal infrastructure projects, including some built by the Corps. Ultimately, the towns that get funding need to be politically connected and prosperous enough to carry some of the costs, he said. Corps spokesman Gene Pawlik said the agency doesn’t use community demographics when considering which beaches to support, but it may consider how vulnerable populations such as the elderly and the disabled are affected by storm damage, he said in an email. Insurance companies retreated from some communities amid stronger storms, leaving a “last-resort” plan to fill the growing gap. Beach projects are supposed to be supported, in part, by local funding. The first time around, the federal government usually pays 65 percent. Repeat applications are generally split 50-50 with the Corps. A.R. Siders, an environmental fellow at Harvard University who studies coastal climate change and adaptation, said the program would be more sustainable if local governments paid a higher share of the cost. If those who benefit the most take on more of the financial burden, Siders said, it might encourage community leaders to enact zoning regulations or take other steps to reduce flood risk. It’s gotten harder to pry funding from Congress during the regular appropriations process, which budgets $50 million to $70 million annually for beach nourishment, Brockbank said. But after major storms, massive relief bills can include many times as much money. The post-Hurricane Sandy aid package included more than $5 billion for Corps repairs, and a significant portion went to beaches. A Corps spokesperson said the North Atlantic region has spent $1.5 billion so far on renourishment. In some cases, the Corps paid 100 percent of the costs. Mauriello, the former state environmental commissioner, said the political calculus changes after storms: Beaches that wait year after year for money through the regular budget process suddenly receive Congress’ benevolence. According to the Corps, three-quarters of the $1.5 billion went to projects that were new or were only half-completed when the storm struck. A 2015 study said oceanfront properties in New Jersey could lose up to a third of their property value if the federal government stopped subsidizing beach nourishment. Emergency funding also comes from FEMA. Towns with previously replenished beaches can apply after major disasters to replace the sand lost in the storm. In 2011, the town of Nags Head on the Outer Banks used local and county funds for a $36 million project. In 2016, Hurricane Matthew washed much of that sand away. So FEMA gave it $16 million to help replace that sand. A FEMA spokesperson said the agency only funds projects that meet certain criteria: For example, communities that already receive money from the Corps are ineligible. When asked whether beach nourishment was an appropriate use of federal taxpayer dollars, the agency said its practices are based on disaster relief laws. After Hurricanes Joaquin, Matthew and Irma, FEMA also gave a total of $3 million to Hilton Head Island, about 10 percent of what the South Carolina resort town needed, said Scott Liggett, the town’s director of public projects and facilities. The bulk of the money came from local funds. Liggett said Hilton Head has supported virtually all of its beach nourishment since 1993. The money comes from an accommodations tax that generates $6 million a year through hotels and seasonal vacation rentals and is sustainable at least through 2035, he said. Hilton Head’s model is hard to follow. Debbie Smith, the mayor of Ocean Isle Beach, North Carolina, said her small town doesn’t have enough of a tax base to pay for beach projects, so they are “extremely” dependent on federal funds. Ocean Isle has received $33 million worth of beach nourishment since 2001. The town of 650 has 4,000 housing units, so it relies on tourists and second homeowners. 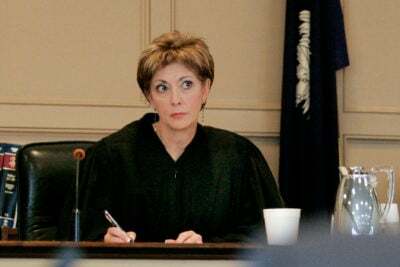 A 5 percent accommodations tax accounts for nearly half of the town’s general fund, she said, and about 25,000 visit the beach every summer. When asked about sea-level rise and the long-term sustainability of beach nourishment, Smith said there was “a lot of difference of opinion” about global warming projections. “I’m not a scientist,” she said, echoing a favorite talking point of politicians who reject the scientific consensus on climate change.